Now surely this is something that everyone needs in their life, regardless of whether you’re a gourmand or a cheez whiz kind of a cook. It’s really a question of look the part and step into the role. All you need is some stiff card, seleotape, scissors, measuring tape and five minutes. Measure the diameter of the head that you wish to adorn and mark that length plus an inch onto the card. Try and find a large piece of old card to re-use rather than recycle. Cut through the card to a two inch border that will form the head band. Clip and then tape the headband to overlap one inch. Reach through the inside and tape the lengths together to form a dome. Go on, indulge your child’s latest whim. Now that’s what I call “positive reinforcement.” When I think of how I had the nerve to ask the staff at Flames for one of their “disposable chef’s hats,” I can feel a blush! What can I say? Pushy Brits. Now that’s something I’d never have been brave enough to do a few years ago. There again the real bravery award goes to someone willing to put something on his head! Don’t forget to check out other participants. On a side note, if you are struggling to pay for therapy for your special needs child, if the insurance has dried up and tossed you to one side, if you ever think for one moment that the whole thing is completely hopeless, takes forever and wonder if you really are doing the right thing…….I’m here to tell you, or rather ask you, to remain hopeful. Posted on May 11th, 2009. Tagged : autism, Carnival, family life, go green, how to, Humour, recycle, step by step guide. 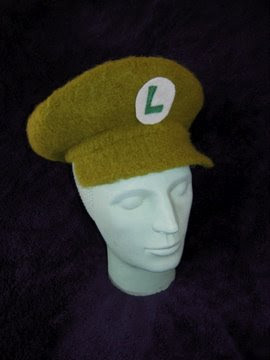 How to make the best Mario and Luigi hats, a do it yourself step by step guide. Mario, the character from Mario Bros Nintendo DS and his brother Luigi, have their two greatest “fans” here in jolly old San Jose, as the “Italian” genes are in the “blood.” Here is the answer for fans worldwide. This is basically a knitted oversized Tam O’Shanter. 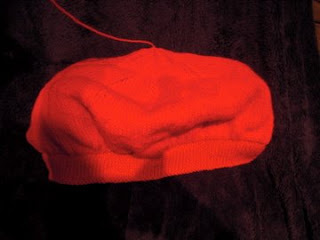 You do not need to be a good knitter as when the hat is felted [boiled alive to shrink] small mistakes are unnoticeable. Measure the circumference of the child’s head just above the eyebrows and ears or wherever you want the hat to ‘sit.’ Find a saucepan or bowl* with the same circumference for later to act as a ‘form’ to support the drying hat. Use pure wool as man made materials do not shrink. [ I have an unshrinkable prototype hat big enough for an average sized East Indian elephant if anyone’s interested?] Take care to match the colour well, although the colour may not show true on the photographs. 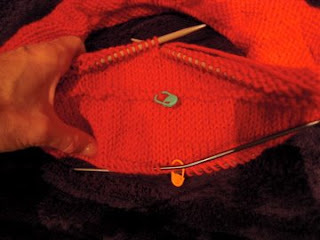 Align both needles and knit one stitch from the front needle and one stitch from the back needle together, continue to the end of the round. This forms the headband. Continue on the larger needle. 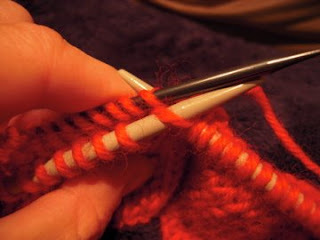 Increase row = Knit one, knit one and make one knitwise into the second stitch. Continue for the next round = 135 stitches. Continue to knit 26 rounds on these 135 stitches. Begin shaping brim / crown. Knit 9, knit two together, repeat to end. Knit 8, knit two together, repeat to end. Find a crochet hook and slip through remaining stitches, pull tight. With a darning needle thread the tail through to the inside. 8th row decrease one at each end. *15th row cast off five stitches knit to end, turn. Cast off remaining stitches and sew in the tail of yarn. 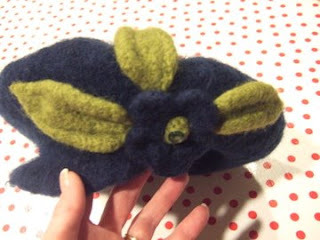 Now the fun begins = felting. Set your washing machine to the hottest setting with a little soap and the greatest agitation. Plunge the hat into the hot water and poke it a bit. Yank it out at one minute intervals to check shrinkage / felting. It’s hit and miss but you can do it! When it looks felted remove from the machine and plunge into cold water bowl in the sink. Rinse out any remaining soap. Squeeze out excess water. Attack your hat with vigour to stretch and pull it into the correct shape and size. Stuff with a old towel to maintain shape and ram it on your bowl. * Place the bowl with the hat on a folded bath towel in a warm spot to dry over the next 24 hours. Whilst it dries make the badge. This is where your magic marker comes in. 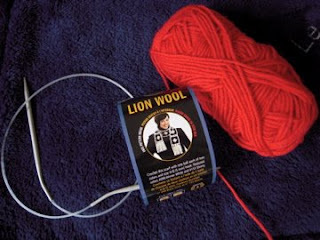 As white wool does not shrink and felt reliably, you will need to buy a small square of regular felt from your local retailer. Cut out a circle of stiff plastic from your re-cycling supplies with a disc of white felt to match. 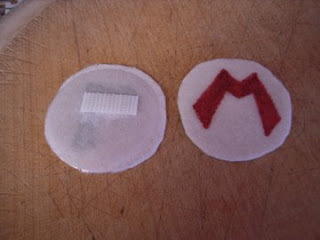 Take a fine sharpie pen, red or green and carefully copy the logo onto the white felt disc. Bear in mind that if this step is not accurate you might as well throw the hat away and give up completely. Glue the felt to the plastic disc. 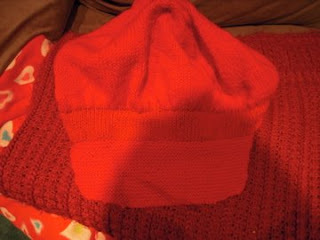 When dry attach a small snib of Velcro to the back, the hook part so that it will snag on the hat. Place the disc in the centre and voila! Custom fit and made to measure. 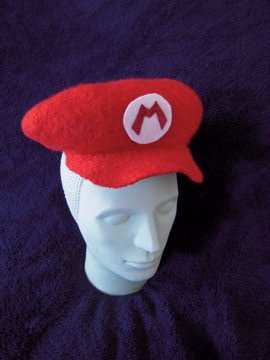 You may also adapt the design for non-Mario fans. Just in case you are wondering who in their right mind would go to such trouble, I can tell you with complete confidence that it was worth every stitch, as well as the three prior failures. My one worry was that they would be itchy. My daughter, the one with half a yard of protective hair curtain, assured me that it is indeed itchy. I dithered over linings but, and oh what a but it is, my tactile defensive wunder kind has had that thing rammed on his head for 24 hours straight. insignia of ‘special,’ as they itch their way through life. There again, I already feel like a millionaire with none of the bothersome business of reality. A more traditional “baseball cap” version. “Yoshi” food for those who prefer to cook rather than sew or knit. 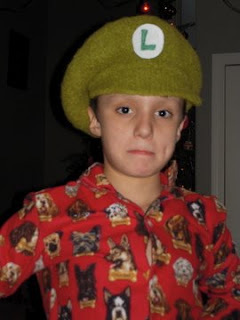 Posted on December 28th, 2008.